and that's one of the reasons I don't work anymore..."
And that quote pretty much sums up (yes, in an egregious simplification) the difference between storytellers and spectacularists (those film-makers who prefer the ephemeral 'Wow!' over the more profound 'Oooh!'). Pevney was happy to ply his considerable craft in both Hollywood movies during the 50s and TV from the 60s onwards. One glimpse at his credits on the IMDB tells you one thing at least. People just loved working with him. Often, for a life, that's enough. For a distinguished and artistically appreciated life in cinema, perhaps not. This isn't to denigrate his pictures but where Orson Welles and Ed D. Wood occupy the polarised best and worst a film-maker could be, Pevney stands resolutely in the centre perhaps leaning in Welles' direction despite his relative and I'm sure intended 'invisible' technique. There is a cultural corner where Pevney is feted over and over again as if his specific contribution, uh... contributed to the extraordinary effect that a small but long lasting TV show had on its myriad of fans. Here was a journeyman director with no pretensions of any kind but he did end up directing more than his fair share of the best that 60s' Star Trek had to offer. Alec Guinness found a lot to be disgruntled about when he realised that his one small part - in a film that no one thought much of during production in late 1976 - had eclipsed a career most actors would die for. Guinness was revered for his acting in such classics as The Man In The White Suit, Bridge Over The River Kwai and Kind Hearts and Coronets. But after 1977, none of that mattered. After all, here was Obi Wan Kenobi and the force (and an extra quarter of a percentage point profit participation) was with him. In trying to revise the impact of Obi Wan on his career and simultaneously disabusing fans of Star Wars being anything more than a middling space located melodrama, many a child's tear was shed. Director Joseph Pevney had Obi Wan syndrome up to his pointed ears but rode with it and enjoyed the out of proportion attention he received. He softly and gently folded his Star Trek work in to his wider career, despite the fact he had directed many Hollywood movies and countless TV episodes of well-known shows produced during his long life. Frank Sinatra was a legend. I don't think this is easily refuted. How he became a legend is another story entirely. Like someone said of Steven Spielberg, "You don't get to be Steven Spielberg by just being a good director..." Well, Frank had the voice, some acting chops but was hardly a god in mortal guise. Now he's singing celestial duets with Crosby, the evidence can seep out like blood from a fresh hit. And according to some reports, the evidence is damning and as irrefutable as his legend status. But we're not here to talk about Sinatra's chronic perjuring (his denials of shadowy relationships were nullified by his big time, powerful friends who made sure 'Ol' Blue Eyes' never had fresh spaghetti sauce on his shoes). I am not saying Frank Sinatra was innocent or guilty of any mob related crime or arrangement. The trouble with Frank is that he liked a certain lifestyle and as most people like to be by the fire, it was a mutually beneficial arrangement. These light conjectures work like eyebrow jacks given the plot of his 1951 film directed by our man in journeyman-land. Danny Wilson is a honey voiced, highly strung, chip-on-the-shouldered, wiry short guy who likes to act tough and invariably gets the wrong end of a fist. With his best friend and pianist partner, Mike (Alex Nicol), the wise guys play the nightclubs scraping by from one disgruntled manager to the next. 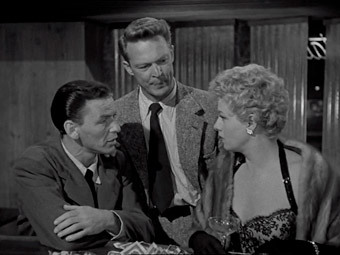 Wilson's temper keeps both men on the hop until they run into Joy (Shelley Winters) who's out for a boozy night and needs 'guys' to walk into a bar with. Her boss, the wonderfully stone-faced thug, Nick (a deliciously malevolent Raymond Burr sans wheelchair) recognises talent when he hears it and in exchange for a break, he makes a deal to take fifty percent of the pair's earnings. Of course, Sinatra being Sinatra, he gets big quickly and starts to despise the mobster in the background (and in jail during some of the running time) taking such a hefty chunk. In the meanwhile, Sinatra falls for Winters while Winters falls for his partner, Nicol. So far, so relatively predictable. People fall out, get back together but all the while Sinatra is played for a sap until he finds his closest friends in a clinch. There is something very sweet about a man who is so in love that he tries anything to stop his fiancée from flying back to New York but the audience (that's us) knows that it's tears before bedtime and the rest of the movie is Sinatra growing up and taking revenge on the mobster. So what's the moral of the story? It's OK to have a violent thug bankroll your first stabs at fame but if you become too famous, the thug becomes a liability and it's best for all that he's mercilessly gunned down. Hmm. Morally, this movie's all over the place. Sinatra bagged an Oscar for his turn, two years later, in Fred Zinneman's From Here To Eternity. Whether the horse's head in the bed in The Godfather was a dramatisation of the real reason he was given that roll is not for me to say. So I won't say it. Pevney's direction is workmanlike and entirely in keeping with the visual style of the day. It opens up a little during the chase at the end but not in a hugely notable way. As Pevney says, chases not his thing... Oh, I forgot to mention. Sinatra sings a lot and I guess that would be a significant percentage of the appeal of this movie as far as Sinatra fans are concerned. I mean that voice... After all in the early fifties, Sinatra's star was burning very brightly. However, on the movie and acting front, Wilson is one for completists only. 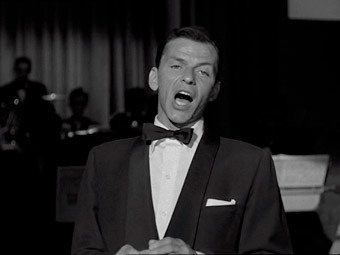 In the nightclub when Sinatra embarrasses himself in Meet Danny Wilson, a young, dark haired boy with striking good looks, encourages Frank to leave. I knew that face (uncredited) from a TV show I adored as a child but something about the boy must have appealed to Joe Pevney. He cast him in the lead of Flesh and Fury. 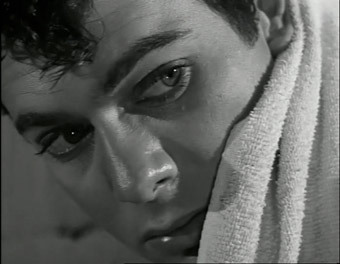 Although already a leading man but by no means a star, Tony Curtis does very well, undercutting his chiselled, boyish good looks and athlete's body with a disability (he's mute throughout most of the film). A boy from the Bronx, Curtis (aka Bernie Schwarz) has always managed to keep a buoyant career bobbing but making the widest and most eclectic of choices. It's a testament to his career that there are very few movies where his star wattage threatens to outshine the work. He's a charming performer with quite a range and he was often something of a rogue who traded on his Hollywood persona and to a degree still does. He's now billiard ball bald but there's still that twinkle in his eye. But it was at the age of forty-six that Curtis came strolling into my life and talk about role models. I suspect most readers of this site can not go so far back in TV history as 1971 unless there's a 'star' or 'trek' in the title. The Persuaders were two self-made men (actually I believe Roger Moore's Sir Brett Sinclair was landed gentry) who were teamed up by a retired judge to undo his own profession's short comings. Crime fighters, mismatched and both seemingly women magnets of the first order, they strolled through twenty-four episodes propelled by an iconic theme tune from Mr. John Barry and beloved by all ten year olds that wanted their adventurers safe, half-American and just so full of life. Curtis' Danny Wilde (memories of those absurd holey driving gloves abound) was a cad and a rogue but what a devilishly attractive one. At that time, my film education was not fulsome enough to recognise that smarmy reporter from The Sweet Smell of Success or the split screen terror, The Boston Strangler, nor the hero of The Great Race, nor the hapless musician at the centre of the fire in Some Like It Hot. He was simply 'Danny', a name shared by a younger member of the Partridge Family, another US export that made an impression. I'm coming to the swift conclusion that if I'd watched these shows as a child in 2009, someone somewhere would be saying "That is soooo gay..." So be it. Curtis, as mute boxer Paul Callon, has the physicality and the drive behind the eyes. Given no lines, his acting is never forced or overblown (thank you Mr. Pevney). 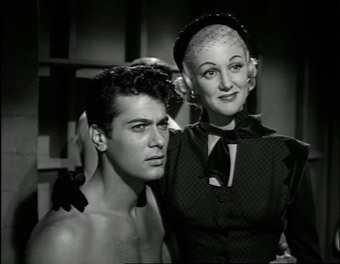 His gold-digging co-star, Jan Sterling, upon threatening Curtis with a broken champagne glass, takes the grimace of upset over the top just a tad. See how I did that? The star does something good, so I credit the director. The co-star overacts and I blame the actress. What unfairness, what critical dwarfism, what can I say? She played her role so well, I hated her from moment one. Her turn in Billy Wilder's brilliant Ace In The Hole was a year earlier and still critical opinion was that her performance in Fury was a career highlight. Times change. I'm reminded of Bruce Lee's early Chinese movies in which he appears almost pantomimetic, gurning and grimacing but as the informed commentary tells us (the redoubtable Bey Logan), this was good acting in context and of its time. Curtis goes from the Femme Fatale (FF) to a kindly manager who has to play her game and then Curtis meets up with a reporter, Mona Freeman, who's lived with deafness in her family. At last, somewhere Curtis can fit in, much to FF's chagrin. In love with the girl who can open up new worlds and spurning the gold-digger content to keep him underground, guess whom he ends up with? And there's a hearing restoring operation! It's all here; melodrama directed impeccably by the straightforwardly efficient and actor friendly Joseph Pevney. Give a little cheer for the journeyman. Both discs feature crisp, clean 4:3 prints (I really miss black and white) and I just adore the infinitesimal wobble of the optical titles (unlike today's perfection rendered by computer). The prints are almost preternaturally clean so someone has looked after these movies. The Dolby Digital rendered mono sound on both is also clean and with very little to criticise in terms of inaudibility. Notably, Wilson relies somewhat on good sound because half the punch of the picture is listening to Sinatra sing. There are no closed captions or subtitles on either disc. Nothing on Fury but Wilson features a trailer (2' 20") which is wonderful in what it says about what used to get the punters into the theatres in the early 50s... "THE VOICE," it says in huge white letters obliterating the image beneath, "...that thrills the world!" And then (to make the point) "The BLONDE BOMBSHELL that thrills him!" Marvellous. A bit of a shame the trailer gives away Frank's doomed attempts at romance but there we are. He can't have everything (but boy, did Sinatra try). For movie star completists everywhere. Both are decently presented and look terrific but beyond Tony Curtis and Frank Sinatra fans, the discs will be struggling to find an audience. But that said, both movies were entertaining in a mild and undemanding way.